Earlier this season, much was made of the increase in scoring, including here at The Arc. In the first three rounds this year, teams were averaging a combined 185.5 points per game, up from 171.9 in 2015. That solid bump in scores made many of us think that the score changes introduced this season – a tighter cap on interchanges, more stringent interpretation of the deliberate out of bounds rule – were having a positive effect. The trend towards turgid, low-scoring games seemed to be turning around. It now looks like the increase in scores was just a blip that hasn’t been sustained. In Round 19, average scores were just 169.3, below the average for this point of the season in 2015 and 2014. 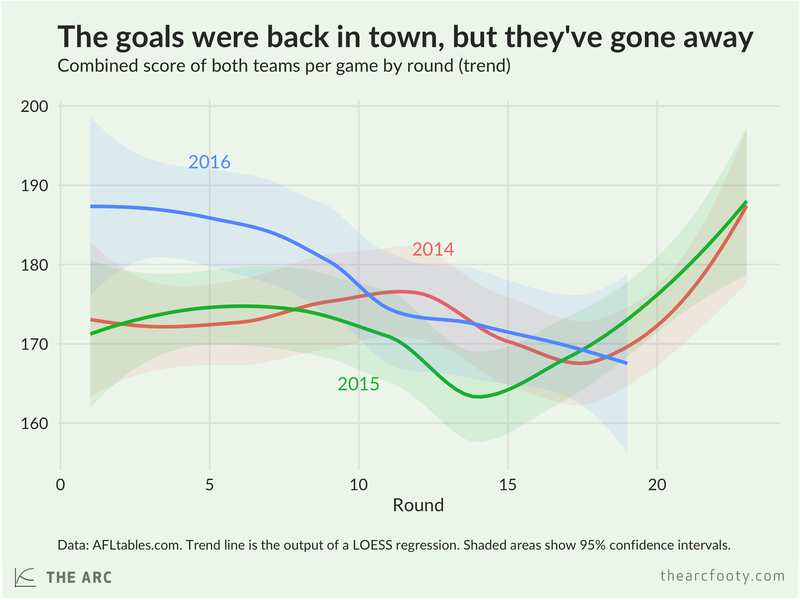 Since Round 10 or thereabouts, scores have been around the same level as in the past couple of years. Goals are extremely good and cool. It’s a shame that the efforts to increase scoring seem to have faltered, at least for now.